Patented Technology destroys odors...even skunk! 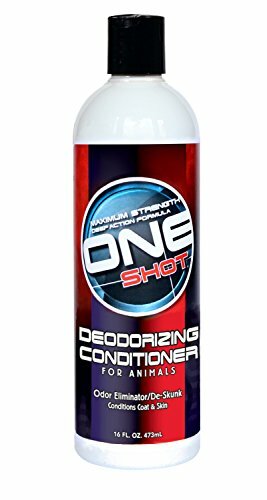 ONE SHOT Deodorizing Conditioner totally neutralizes and inhibits pesky reoccurring odors once and for all! Its "No-Mask" formula instantly devours and destroys pet odors permanently. Penetrates deep within the skin to rid embedded odors and refresh. Conditions coat and skin. Pleasant fresh scent. Dilutes up to 5:1. Safe for Horses, Dogs, Cats, Puppies & Kittens. Available in 16 ounce and gallon sizes. Try all three ONE SHOT deodorizing products for Total Odor Annihilation! Step 1: ONE SHOT Deodorizing Shampoo - Target and encapsulate pet malodors engulfing them so they simply rinse away during the bath. Step 2: ONE SHOT Deodorizing Conditioner - This conditioner penetrates deep within the skin engulfing and releasing stubborn set odors that otherwise resist bathing treatments. Step 3: ONE SHOT Deodorizing Spray - Deodorizes the surrounding environment from odors left behind. Pet and fabric safe! Engulf lingering airborne smells throughout your home.